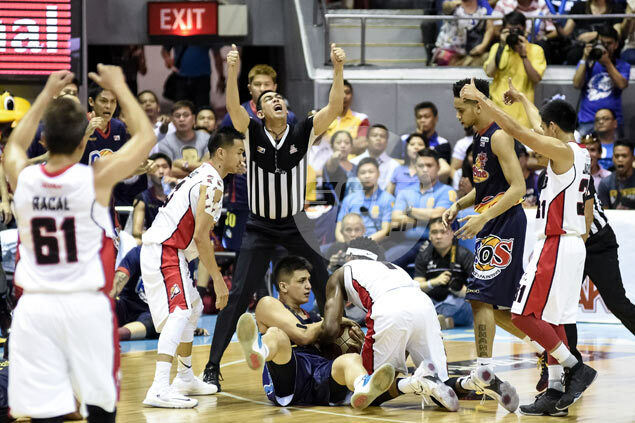 NOT a few readers have noticed that they haven't been seeing referee Edward Aquino officiate any of the games in the PBA Governors Cup playoffs - and sought some explanation through our comments pages. It was easy to understand why fans noticed his absence, considering Aquino has been the pro league's most high-profile and most controversial game official since the days of Ernie De Leon and Bay Ledesma. Aquino, like all other referees in the league whether new or old, has been slapped with suspensions and other penalties every now and then for game-related miscalls and other infractions. But league old-timers believe this is the first time the former Philippine Christian University Dolphins forward has not officiated in the playoffs. Romy Guevarra, who served for a long time as technical chief of the PBA, was surprised by Aquino's absence from the playoffs, saying a suspension of a referee as high-profile as Aquino - that is, if he was indeed suspended - should at least be explained in public. “Dapat pag ganyan, ipinaalam sa publiko yan kasi tradisyon na ng PBA 'yung ilabas ang transactions and sanctions nila,” said Guevarra, who left the PBA as chief of referees in 2010 and is now a technical consultant for both the UAAP and the NCAA. Intrigued, SPIN.ph sought an answer and got one from PBA media bureau chief Willie Marcial, who confirmed that Aquino, indeed, has been left out of the pool of referees for the Governors Cup playoffs by Commissioner Chito Narvasa. Asked why, Marcial simply said, "Pinagpahinga ni Kom (Narvasa)." Marcial said it was not just Aquino but also two other referees who have been left out of the pool of referees in the league's season-ending conference. Rommel Gruta and Reynaldo Yante, he added, have been relegated to the D-League since the start of the Governors Cup. However, Marcial said he can't give a detailed explanation on the decision to pull out Aquino from the referees' playoff roster, saying it is the league's technical committee which handles those things. Asked what's the official status of Aquino, Marcial said all the league's referees are contractual employees whose deals are set to expire at the end of the season. On whether he will be retained or not will depend on the performance review, he added. 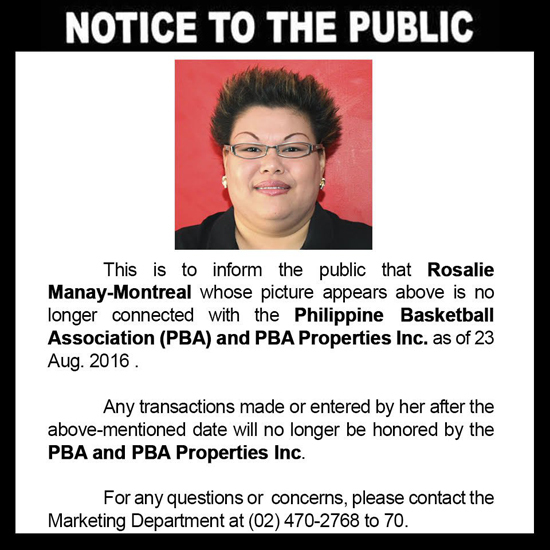 Curiously, Aquino was left out of the pool just days after Rhose Montreal, who league sources said is the referee's common-law partner, was let go by the PBA board as its head of marketing. Pressed for comment, Marcial said he doesn't know if Montreal's exit - or the circumstances leading to her departure - had anything to do with Aquino's current status. 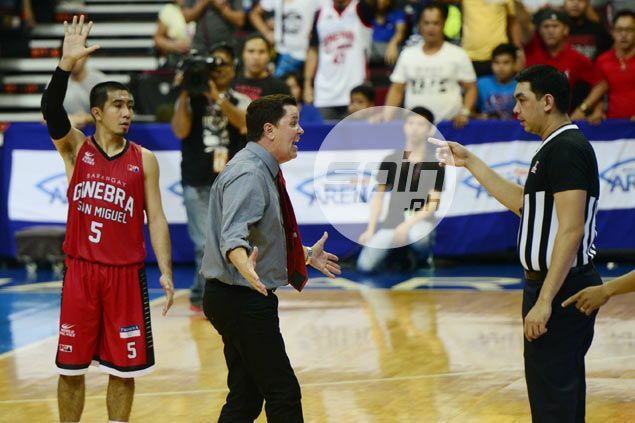 Guevarra said he believes that Aquino is still one of the most seasoned referees in the PBA. The veteran game official bared that it was him who discovered and honed the officiating skills of Aquino. “Ako ang nag-train dyan eh mula amateur siya hanggang sa magkasama kami sa PBA. Honest 'yan, kilala ko 'yan. Pero like I said, 2010 pa ako last nakatapak sa PBA. Kung may mga nabago man ngayon, hindi ko na alam,” he said.